180-gram 4LP Box Set pressed at Quality Record Pressings! After a nearly five-year break from touring, Rush returned to the stage in 2002 to support the trio's 17th studio album, Vapor Trails. During the tour, Geddy Lee, Alex Lifeson and Neil Peart played to some of the biggest crowds of the band's career, including 40,000 people at the tour's final stop in Rio de Janeiro. 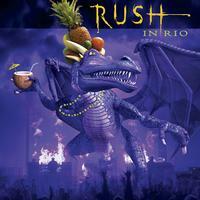 That concert was released in 2003 as Rush In Rio, which was certified gold in the U.S. and Canada. This configuration of Rush In Rio is four 180-gram LPs. The set is presented in a heavyweight gatefold jacket and comes with a code that allows the music to be downloaded digitally. The collection includes all 29-songs the Rock and Roll Hall of Famers' performed at the concert in Rio, plus two bonus tracks that were recorded at other stops during the Vapor Trails Tour. "Between Sun & Moon" was recorded on September 27, 2002 in Phoenix, AZ and "Vital Signs" was recorded on October 19, 2002 in Quebec City, Quebec.